Written by Fred Patten, and intended for Apa L, 2200th Distribution, LASFS Meeting No. 3649, July 12,2007. Michael Burlake told me a couple of weeks ago that he would be at Anthrocon 2007 in Pittsburgh last Thursday, so I did not expect to see him again until this Thursday. But last Wednesday he made an unexpected visit to my hospital just a couple of hours before his flight, with a miniature tape recorder so I could dictate some brief "greetings" to various Anthrocon attendees. It was a very nice gesture, and I hope the Anthrocon attendees appreciated it. I do not know yet if Burlake was able to record any messages back for me. Last Thursday my sister Sherrill brought me to the LASFS meeting. The ground under the lemon tree was littered with giant lemons almost big enough to replace the Apple Bonkers' green apples in Yellow Submarine. Under special orders of business, Jerry Pournelle gave an obituary for Fred Saberhagen, who died during the previous week. I tried to add one for Sterling Lanier, who had died the day before Saberhagen, but I was told to shut up because that would be announced later in the meeting. John DeChancie's first meeting as Scribe in the new administration went off weirdly; but they were not his minutes of the previous meeting that he was asked to read. Westercon and Anime Expo reports were given; both were called successes, although Westercon 60 had 800 attendees and Anime Expo had over 50,000. Rob Powell advised me to be sure to see Ratatouille; it's great! There was a long obituary at the end of the meeting for Rob Cole, but when I realized that the meeting was about to be adjourned without mentioning Sterling Lanier's death I made an objection. I was told that since a motion to adjourn had already been made, Lanier's obituary would have to wait until next week. Grump. On Friday, Sherry visited me at the hospital and brought me a sample bottle of Jarritos soft drink (strawberry) so I could find out what it tastes like. Yum! - better than any other strawberry soda pop that I can remember since Bireley's uncarbonated soft drinks disappeared during the 1950s. I suppose that Jarritos is bottled in Mexico with real sugar instead of corn syrup like most U.S. soft drinks today. I would recommend Jarritos even more strongly for the LASFS' new vending machine, except that it comes in glass bottles which might break in the machine, and it requires a bottle cap opener which I assume is not built into the new vending machine (although many LASFen carry Swiss Army pocket knives with bottle openers). Too bad; but I will definitely recommend Jarritos for the Con Suite at the next Loscon! It is worth providing a bottle opener for. On Sunday, the hospital let me spend the afternoon at Sherry's apartment for the first time since January. It was a pleasure to get back to my study there after five months. I got caught up on some mail, sorted a lot of books, watched an old movie, The Dragon Murder Case (1934), on Sherry's TV, and had a pastrami & sauerkraut sandwich on rye (which the hospital dietician would probably not approve of) for dinner. If the hospital does not find my sores worsening over the next few days from this outing, I will hopefully be declared cured for longer outings. I forgot to mention last week that Anthro #12, July-August 2007, is now online. It has my latest furry book reviews, plus reprints of my reviews in Yarf! of anthropomorphic s-f & fantasy from 1995 through 1997. Usually I review only brand-new books, but editor Quentin Long has asked me to start reviewing classics as well, to make Anthro's file of reviews of Furry literature inclusive of all the most important Furry books no matter when they were written. That is a laudable goal, so I have a review of Animal Farm by George Orwell (1945) in this issue. I will probably cover Watership Down in the next issue. After that, there are numerous novels of more-or-less equal "classic" status: Jonathan Livingston Seagull by Richard Bach; The Wind in the Willows by Kenneth Grahame; Sirius, a Fantasy of Love and Discord by Olaf Stapledon; Tailchaser's Song by Tad Williams; Who Censored Roger Rabbit? by Gary K. Wolf -- I am open to suggestions as to which Furry novels are the important classics that I should review next. Vanamonde #737 - (Hertz) I was at the premiere of Forbidden Zone at Filmex '80, where one of the Elfmans, Danny (who wrote the music and played Satan) or Richard (the director and co-producer), sprayed the first several rows of the audience with a white, sticky substance that they said was sperm, but others said was whipped cream. Forbidden Zone is s-f or fantasy (it is so gonzo it is hard to tell which), so it should be shown at one of the LASFS' movie-screening events - whipped cream optional. ## The Canadian government issued a 45¢ postage stamp in October 1995 honoring Superman as a Canadian superhero because of Joe Shuster's Canadian birth. ## So much for John Jacob Astor IV's 1894 prediction that in the 20th century, America would be crossed by highways of rubber (speed-controlled by "instantaneous Kodak" speed traps) that electricity-powered automobiles with concrete tires would drive on. Godzilla Verses # 147 -- (DeChancie) If you are in serious pain and on heavy morphine-based analgesics, forget about Buck Rogers - Forbidden Zone is what you ought to be watching. ## If Jerry Pethick's Time Top sculpture actually looks like the Time Top in the Brick Bradford comic strip, whether you call it ugly or not, it ought to get a lot more artistic credit than those abstract-art public sculptures that look like nothing but random boulders or hunks of steel welded together haphazardly, for which the artist charges $50,000. ## I liked Richard M. Powers' s-f covers, but I respected those that looked like they had something to do with the story (his cover for Bester's The Stars My Destination, for example) much more than those that were so abstract they could have been used on any "futuristic" book interchangeably. De Jueves #1538 - (Moffatt) You can get a list of the books you want from the County Library's online catalogue in advance of your visit to the branch of the L.A. County Library near you in Norwalk. Any that are not at that branch can be reserved and sent there for you from whichever of the Library's other 116 branches (not counting bookmobiles) they are in. The County Library's whole collection is much vaster than what is at any single library. ## It might have been calf's blood instead of pig's blood in the blood/black pudding cookies we got in Glasgow in 1995. I no longer remember. ## Do the boutonnières in the two pages of Lackadaisy reprinted in ¡RR! look like marigolds? They are all the same kind of flower. Toony Loons #49 - (Zeff) I understand that all Westercons now have much smaller attendances than they used to in the years before all major cities started their own annual local conventions. ## But a movie made during the 1920s wouldn't show boutonnières if it was a period drama like The Mark of Zorro (1920). Oh, All Right!!! - (Lembke) I heard of the expanding Earth theory in college, along with the Hollow Earth theory. Edgar Rice Burroughs wrote several good novels using that theory (At the Earth's Core, etc. ), so it should be possible to write s-f using the expanding Earth theory. 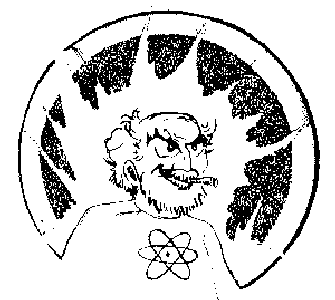 Lester del Rey wrote a novel, The Sky is Falling, using the Ptolemaic theory that the sky and stars are part of a big crystal sphere rotating above the earth. The sphere is shattering and the protagonist has to repair it. I don't know why del Rey wrote it; whether he wanted to show what could arguably have passed as s-f 2,000 years ago; but it was a good s-f novel. (Well, make that a passable novel; it was not one of del Rey's best.) Dave Duncan has just written a two-book adventure fantasy, Children of Chaos and Mother of Lies, set on Dodec, a planet that is a natural dodecahedron with twelve pentagonal sides each larger than Asia; a form which he admits in an Appendix cannot exist in nature due to gravitational forces. But the books have maps and dramatic descriptions of the hardships involved in crossing over the edges from one side to another. How dramatic would living on an expanding Earth be? Come to think of it, Charles Eric Maine's The Tide Went Out, in which a hydrogen bomb test in the Pacific Ocean blows a hole in the bottom of the ocean and all the water runs out and the world is destroyed by thirst, might be described as being based on a contracting Earth theory; that as the Earth grows cooler its molten core contracts, creating vast empty caverns under the surface crust. Hmmm; what are the theories behind Doyle's "When the World Screamed" and Bond's "And Lo! The Bird"?